Following the launch of the latest men's apparel collection, Peter Millar has now revealed its new Spring Summer 2019 Ladies range that draws on the seaside through its design of leisure-wear, fabrics, colour tones and vibrant floral styles. 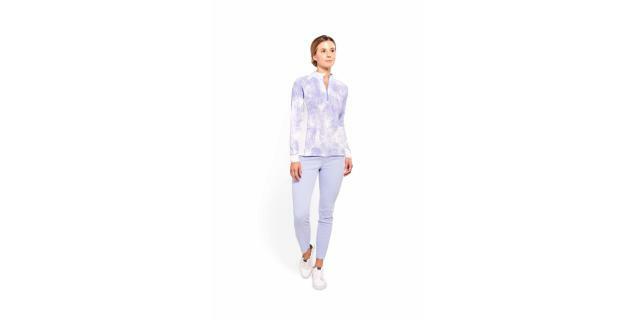 The Peter Millar Ladies SS19 collection can be worn both on and off-course and encompasses everything from polo-shirts, 2nd layers and outerwear to skorts, trousers and accessories. There’s a look for everyone, from the more classic whites and tonal coloured garments to the bolder floral and snake print performance layers. Peter Millar has become the standard bearer in golf lifestyle clothing for discerning and stylish individuals who demand the very best in fit and performance. Founded in 2001 with a single cashmere sweater, the brand has grown into a premium international lifestyle brand featuring a wide range of casual sportswear and luxury performance golf apparel for men and women. The Perfect Fit Performance Polo is meticulously designed from a polyester-spandex blend fabric that provides a luxurious feel and a flattering drape. The nature of this fabric offers four-way stretch, UPF 50 + sun protection, moisture-wicking and quick-dry. It’s constructed with a shorter, more feminine self-fabric collar, a five-button placket and a slightly flared notched hem. Discerning details, like contrast threading at top button and hem bar tack and contrast piping at neck interior, add a sophisticated touch. Our Sleeveless Zip-neck Polo is made from a special stretch jersey fabric that offers four-way stretch, moisture-wicking, quick-dry, easy-care and UPF 50+ sun protection. A gentle flare adds coverage to the silhouette. Finished with knit collar and contrast piping to accent the look. Our highly lauded performance quarter-zip in an elegant cut for women. This versatile style is made from stretch terry mélange fabric that’s breathable and provides a smooth lustrous, colour-rich finish. Features moisture-wicking and UPF 50+ sun protection for active comfort. Styled with mock collar, elongated waist for coverage and quarter-zip closure. Our Palms Sun Comfort Base Layer is made from a special stretch jersey fabric that offers four-way stretch, moisture-wicking, quick-dry, easy-care and UPF 50+ sun protection. Updated mesh panels provide a clean appearance and a gentle flare adds coverage to the silhouette. Finished with mock collar, chin guard at top of quarter-zip, zipper garage and contrast piping to accent the look. This impressive layering piece is made from premium polyester fabric and designed with a sleek snake print for a stylish appearance. Looking for multiple looks? This vest reverses to a solid navy for endless layering options. Finished with a hidden zip-front closure. Perfect for breezy days around town, this sophisticated jacket is made from premium windbreaker material. This impressive fabric features a soft hand and extremely quiet finish. Designed with an elegant fish tale for ideal coverage. Finished with a two-way front zip closure. Perfect for your next jaunt outdoors or night on the town, this semi-sueded, fully lined field jacket features a water-repellent finish that’ll keep you dry at all times. It’s designed with a removable cashmere collar that provides superior comfort to a traditionally utilitarian design. Finished with a hidden snap, two-way zip closure and side entry pockets. An elegant second layer, this sophisticated V-neck sweater is crafted from ultra-fine, worsted cashmere yarns. Designed with fully-fashioned seams at sleeve and collar and French seams at shoulder. Style this sweater over sport shirts for a lightly layered appearance or wear next to skin. The Petal Hem Sport Skort is made from an intuitive two-yarn moisture-wicking fabric that pulls perspiration away from the body to keep you dry and comfortable on the course. Additionally, this fabric provides ideal performance benefits like four-way stretch and UPF 50+ sun protection. Incorporated in this season’s design is an updated yarn that allows for less clinging and a more flattering drape. It’s finished with quarter-top pockets, an attached shortie and a petal hem for an elegant appearance and ideal coverage to the silhouette. To browse and purchase the Peter Millar Spring Summer 19 collection visit www.petermillar.co.uk. Follow Peter Millar on social media: @PeterMillarGolf.